During my 56 km bike ride today, I ate at this nice little Italian place called "Kakaki" in Kugenuma Kaigan near Enoshima, at Kugenuma-bashi, along Rt. 134 the coast road. The owner, presumably Mr. Kakaki (? ), was personable and spoke English. The table help was a charming young lady, who did a great job despite it probably being her first job, judging from her youth. The lunch set was about 1500 yen, and included a simple but good vinaigrette salad, "kakaki style" with a little cheese, salami and prosciutto, fresh-baked bread flavored with poppy seed, a choice of pasta and a small dessert. 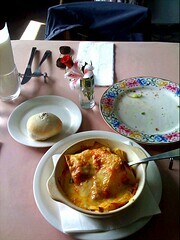 I had the lasagna, which had nice crispy parts and those great-tasting burnt-cheese bits along the edge of the crockery. Yum, I'll be back!